A few months ago my skin was at its worst. It was dry, lacking radiance, was sprinkled with breakouts and was very dehydrated. Fast-forward to now and a part from the occasional spot – because we can’t escape those monthly hormones – my skin is looking and feeling the best it has in ages. Now, my staples have stayed the same – cleanser and moisturiser – but I have introduced a few new pieces to my skincare routine, and I’m very happy with the results. If you caught my Glossier review, then you’ll know I’ve been using a serum both day and night, which has definitely helped with hydrating my skin. 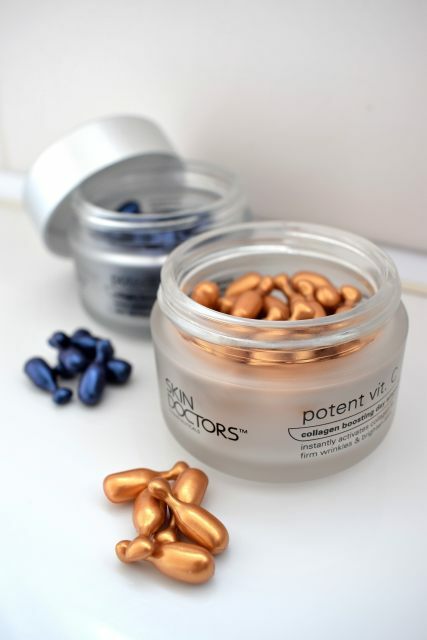 I’ve also been using collagen boosting ampoules for both day and night from Skin Doctors. 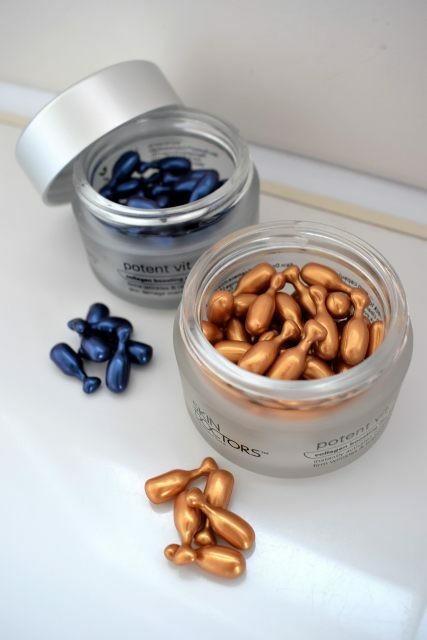 During the day I’ve been using the Potent Vit C, which promises to firm wrinkles and brighten my skin, and on an evening I’ve been using Potent Vit A, which again, is set to firm wrinkles and repair skin damage. 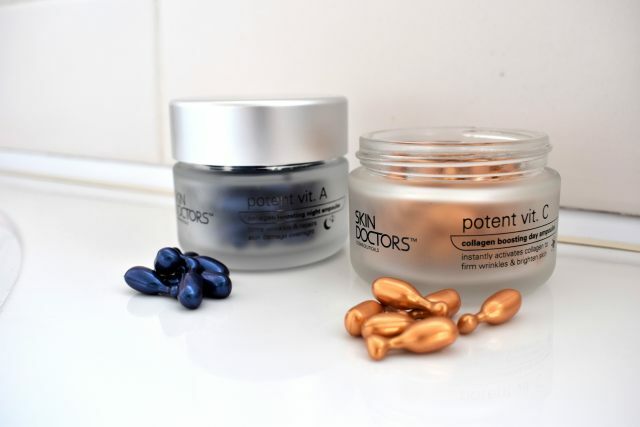 Now, I’ve previously tried the Instant Eye Lift serum and the Instant Face Lift cream from Skin Doctors and I was very impressed with the results, and I’m pleased to say I’m even happier with the results from these ampoules. I’ve been using these every day for over a month now and even though you get 50 capsules in a jar I still can’t see the bottom of the jar – it feels like they’re never ending, which is definitely a good thing. 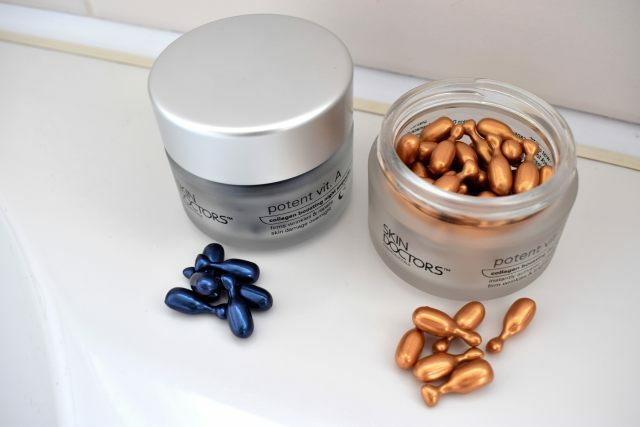 The capsules themselves are really easy to open – with just one twist you’re able to access the liquid within them. There’s only a small amount of liquid within each one, but it does go a long way. With one capsule I’m able to apply it to my whole face, eye area and on my neck. Both the Potent Vit A and C liquid feels velvet to touch and absorbs into my skin pretty quickly. I know each one does something different to my skin, however, the combination of them both has left my skin feeling smooth, supple, soft and generally in such good condition. Like I said before, my skin lacked radiance and especially in the winter months my skin always looks a little dull anyways. Thanks to the Potent Vit C ampoules my skin looks a lot brighter and more illuminated. My skin now has a lovely glow about it, which makes me look fresh-faced and awake. 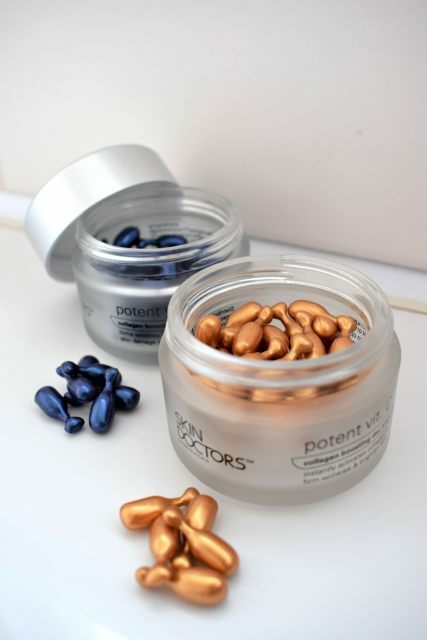 Both the Potent Vit A and C are set to activate collagen production within the skin to help firm wrinkles, and on top of that the Potent Vit A is set to repair, restore and refine the skin while also fighting the sign of fine lines. When applying the nighttime liquid I’ve been focusing on my eye area, forehead and neck. To be honest I wasn’t expecting to notice a great deal in terms of my fine lines, but I have. Thanks to the Potent Vit A I’ve noticed that the crows feet around my eyes are not as prominent and have reduced in size. My crows feet are what I worry about and I can’t believe I’ve actually found something that works for them. Now, I know I won’t get rid of them completely – I mean you can’t turn back time – but I think if I continue to use these capsules I’ll definitely continue to see an improvement. Have you tried Skin Doctors before? Do you have any fine lines that you’re worried about? Or is your skin looking a little dull? Have you introduced anything new to your skincare routine?